Loved the new flag. Too bad. I kind of like the new design, though I might have chosen something besides black to the upper left. 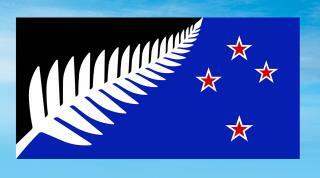 The New Zealand and Australian flags are so similar, and this differentiated New Zealand in a way that really represents the country well, I thought. The fern, to me, represents the uniqueness and stunning beauty of New Zealand. The Southern Cross represents the county's location and history. But the citizenry didn't agree to the change. So be it.